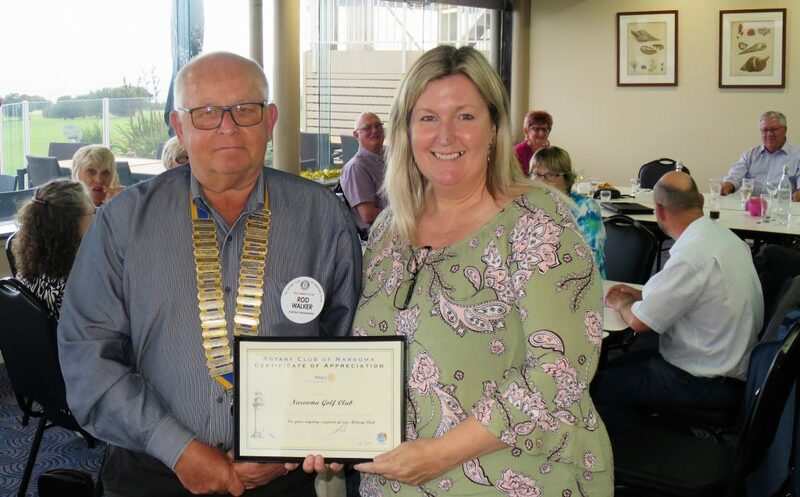 Laurelle Pacey – Page 2 – Narooma Rotary Club Inc. 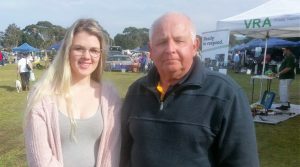 It was wonderful to catch up with our 2016 Tertiary Scholarship holder Melanie Miller at the markets on Sunday. She is currently doing a Bachelor of Clinical Exercise Physiology at UNE. I really enjoyed last week’s meeting where Dianne McInnes gave us an introduction to palmistry. It was a lot of fun. This week we don’t have a formal guest speaker but encourage you all to come along with a story you are prepared to share. Perhaps the theme can be ‘My most Memorable Moment’. Thanks to all involved with Sunday’s market. Takings were Gate $770, Van $394.20, Wishing Well $158.65. Twenty years on these sentiments still ring true. President Rod thanks last week’s guest speaker Dianne McInnes. A good crowd enjoyed another great speaker last week, thanks to Angie’s diligence. Dianne McInnes (mother of our own David McInnes and of course mother-in-law of Rachael) kept us well entertained with the basics of palmistry. She had us all checking out the shapes of our hands, the length of our fingers etc, and of course the various lines on our palms. Another very enjoyable night. 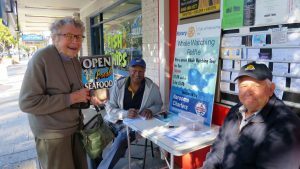 Narooma Lions and Narooma Rotary Clubs are inviting various community clubs and organisations to join them in a Club Information Expo at the October Rotary markets on Sunday 28 October. The aim is to try and recruit new members. She said many service clubs in our area are finding it difficult to recruit new members which makes it difficult to meet services and objectives. 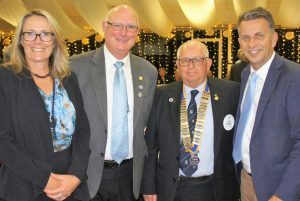 Moruya Rotarians have really got behind their own drought relief project with $6,000 being distributed with the help of the Rotary Club of West Wyalong. Moruya’s Board made $2,000 available from its Charity Account and various donations and a bucket collection raised a further $4,000. 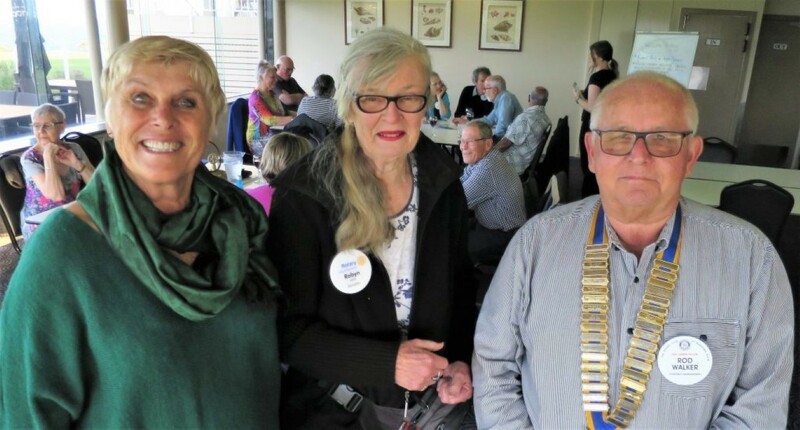 Moruya’s Col Jay identified that the Rotary Club of West Wyalong serviced one of the worst affected areas; he’s working out details with West Wyalong Rotarian Pat Cleary who runs their Service Projects. 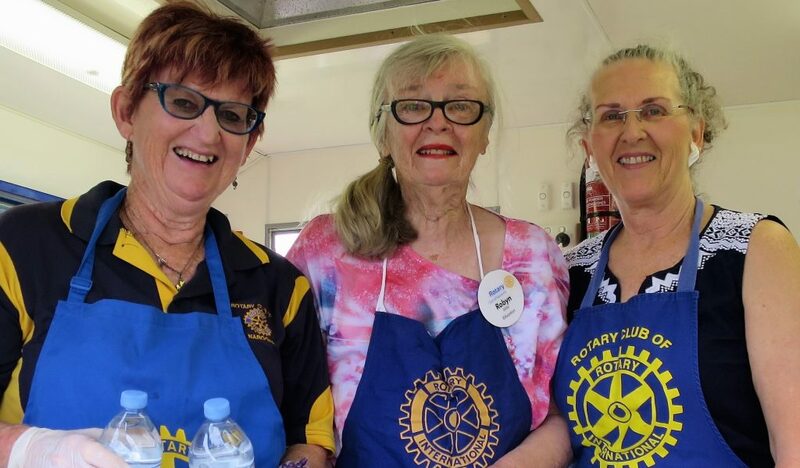 Several Moruya Rotarians have gone over there with their caravans – Col and Bronwyn Jay, Steve Young, Rohan and Pauline Gleeson. Please accept this small gift from the members of the Rotary Club of Moruya. As the current drought spreads and worsens, the people of Australia are becoming more aware of how it impacts on our neighbours further inland. We hope that by sending some money to be spent with your local businesses that this will help you and your family as well as the district economy. 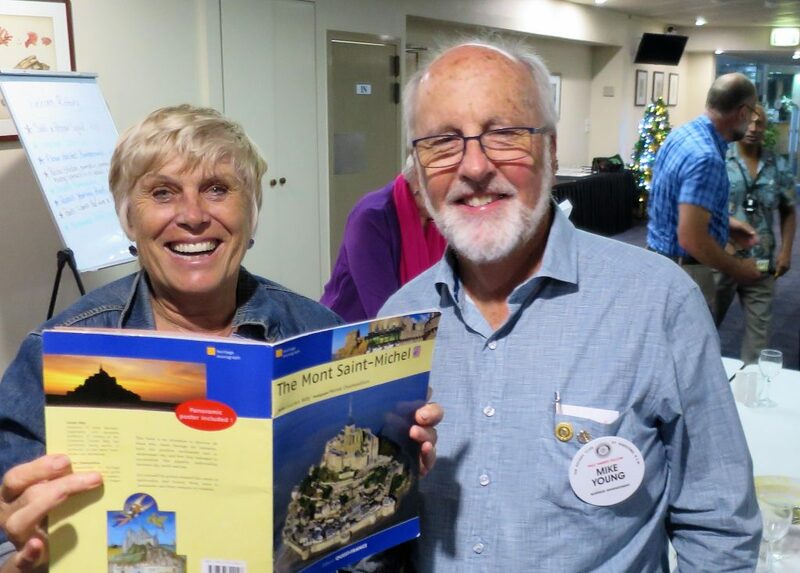 Importantly, when things get better, our Club would encourage you to get in touch (contact details at our website www.moruya.rotaryd9710.org.au) and we will help you arrange a holiday in our beautiful district on the South Coast of NSW. Some members have properties suitable for camping and caravans and others will find you a bedroom I am sure. On behalf of all the members of the Rotary Club of Moruya, our best wishes to you and your family in these difficult times. The Moruya convoy is expected back by Thursday. 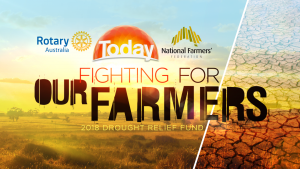 The recent Channel 9 ‘Farm Aid’ Telethon, part of the national fundraising drive ‘Fighting for our farmers – Drought Relief Appeal’ was very successful. This appeal is a partnership between Rotary Australia (RAWCS), the National Farmers’ Federation (NFF) and Channel Nine. So far the Appeal has raised over $8.65m since it was launched on 2 August. Donations are being administered by Rotary Australia and distributed to farmers in need with the help of the National Farmers’ Federation. 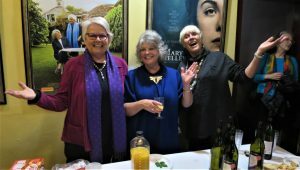 It has already distributed $1m through three organisations: $500,000 to Lions Club’s Need For Feed project to bolster hay runs (hay plus fuel) from Victoria up to NSW, including bringing hay across from Tasmania, and $250,000 each to the Queensland and New South Wales Country Women’s Associations to help farmers pay household bills and/or providing domestic water trucked from nearby towns. NFF President Fiona Simson said the contribution was a great demonstration of the public’s support for Australia’s farmers; they recognised the importance of balancing the need for immediate relief with the need to handle the donated funds with extreme care. Narooma Rotary Club has contributed $1,000 to this appeal. Moruya Rotary will host this year’s Renewable Energy Expo on Saturday 20 October. It’s in St Mary’s Hall from 7.30am. It would be great to have some Narooma Rotarians drop by, and even help. Last meeting was full of energy. 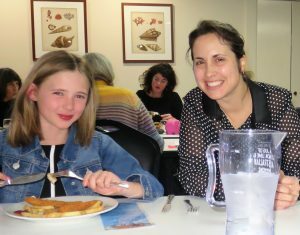 This was thanks to our guest speaker Michelle Garcia, music teacher at Narooma Public School, and her fellow presenters who included David Manning (yr 6 – a grandson of former Narooma Rotary President Kevin Young) and Evie Reakes (Yr 4). Kevin’s daughter also attended. It made me think that we should make more of an effort to maintain contact with former members and their families, maybe an annual dinner. What do others think? Please return all Whale tickets to me at out meeting this week or before. We want to sell any remaining tickets at this Sunday’s Market. Thanks to all ticket sellers, the raffle has gone very well. Our guest speaker is Dianne McInnes (mother of our own David McInnes and of course mother-in-law of Rachael). Her subject: ‘Palmistry – understanding your characteristics, personality and abilities by looking at your hands.’ Dianne is a perpetual ‘course taker’ so has learned about many interesting subjects. Her last sojourn into education was completing her PhD in 2016. 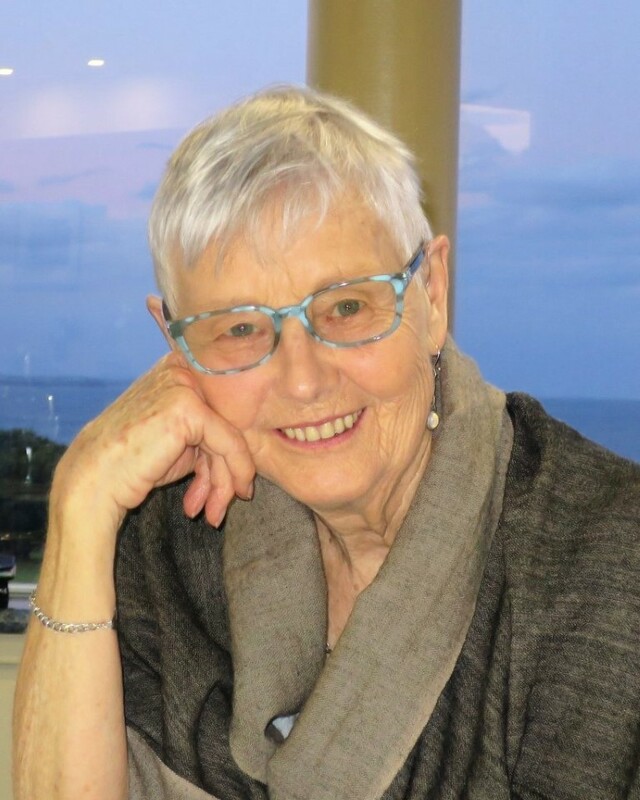 Her thesis analysed the long-term effects of the Tamworth Institution for Boys on those incarcerated there in the 1960s and 1970s. She has had 127 books published on various subjects including biographies, histories and a four- volume encyclopedia on Papua New Guinea. A REMINDER: Please ensure you email Bob Aston by 4:00pm on the Tuesday prior to a meeting if you will be away from that meeting or if you are bringing guests. Michelle Garcia showed us some of the different music programmes she has developed at Narooma Public School in recent years, and some of the range of musical instruments the school now has. There are lunch time and after school programmes. Kevin Young’s grandson David Manning, accompanied by guitar teacher Rob Cove, gave an impressive very first public performance, followed by Evie Reakes playing the piano and singing ‘Amazing Grace’ (and she is only in Year 4!). 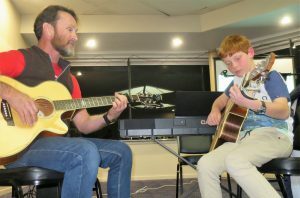 In thanking Michelle, Chris O’Brien expressed what many of us felt, ‘I am thrilled with the development of music programs and musical appreciation at Narooma School’. 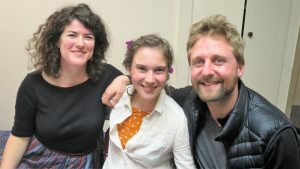 We also had an impressive line-up of musical guests – Frank Eden’s daughter Lara Dodds-Eden )professional concert pianist from Canada, her good friend Katie Zagorski (freelance flautist and piccolo player en route from Hobart to Sydney to take up a new contract) and partner Matthew Wade (forensic psychologist), and a friend of Chris O’Brien’s guitarist Steve Benic (of Kianga). 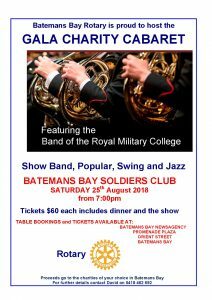 There are still tickets left for Bateamsn Bay Rotary’s Cabaret Dinner this Saturday evening but get in quick . Numbers are needed for catering and seating. Doors open at 6.30 and the Band will commence at 7pm. This is the Bay’s major community function for the year. I have spent the last 10 days babysitting four granddogs and their house in Carwoola. The highlight was when it snowed one morning. Thanks Laurelle for chairing the last meeting and congratulations again to Charmaine for her continuing efforts in Timor Leste. Her work not only reflects well on her but on Rotary also. It is our only International project and we are very grateful for her efforts. As we are in our 60th year I thought I would share the occasional Rotary historical anecdote. In 1958-59, the year we were chartered, there were 9,878 Rotary Clubs in the world and 464,245 Rotarians. The Rotary Foundation totalled $US624,711. Six new countries were represented – Ghana, Guyana, Jamaica, Madagascar, Nepal, and Rwanda. The R.I. President was Clifford A Randall from Milwaukee. His theme was ‘Help Shape the Future’. Our guest speaker this week is Michelle Garcia, a music teacher at Narooma Primary School. Her presentation entitled ‘Music for the Primary Student’ will explain her new music program for students Kindergarten to Year 6. 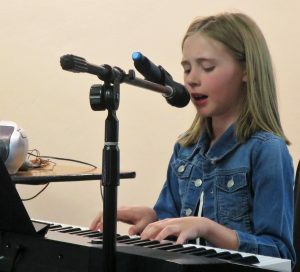 She will whizz through singing, rhythms and instruments leading us into the After School Music Program; you will meet the after school teachers, learn what they do and be entertained. We have a number of Rotarians away so please bring as many friends as you can. It was another interesting meeting last week. 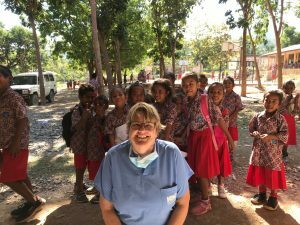 Charmaine White spoke about her recent two weeks with the dental project in Timor Leste, her eighth ‘tour of duty’ on an aid project. It was a joint RAWCS, Lions and Carmelite nuns’ project.Charmaine has considerable admiration for the people of Timor Leste who she says “earned their independence”. She is impressed that everyone works – men, women and kids. Since independence they have greatly improved literacy. She said under the Portuguese, only 5% of the population was literate. Under the Indonesians,10%. Now it’s about 65%. She also spoke about the ‘missing’ generation because of the wars; there’s a lot of younger people and older people, but not many in between. Unfortunately few of the younger generation respect the knowledge of their Elders about their land. Power was off eight times during her two weeks there, so they had to resort to their trusty back-up generator. She mentioned a solar panel project at the Carmelite orphanage that no longer worked because rats had eaten through the wires. Charmaine has followed it up on her return and has contacted the Australian supplier who will try to have it fixed by their local agent and the wires encased in conduit to hopefully prevent the problem recurring. Also last week, membership was discussed at the Club Assembly and how to possibly reach newcomers to the area, perhaps in conjunction with other clubs and organisations. 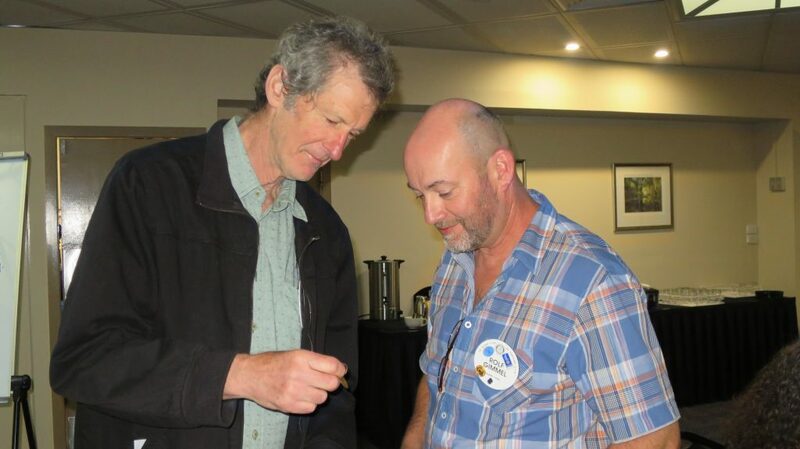 Moruya Rotary’s plans for hosting the 2018 Renewable Energy Expo are well advanced. It will be held on Saturday 20 October in St Mary’s school hall. Registrations are now open for the District Conference to be held in Cooma 5-7 October. Registrations and details are on the District website. Would fortnightly meetings encourage younger members? 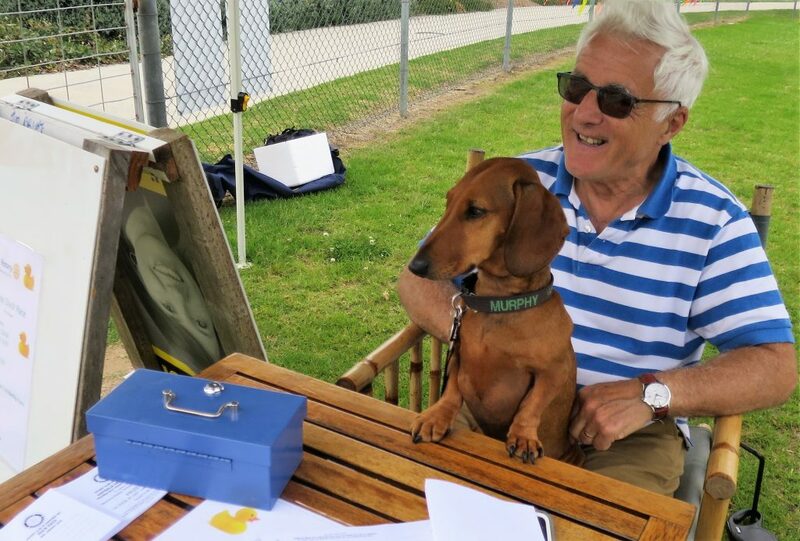 New Moruya President Hack Ward thinks they might; he has proposed that their Club trial fortnightly meetings with the hope of attracting younger members. 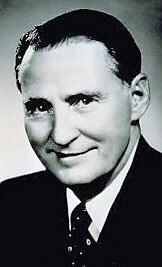 He contacted three clubs who had made that change and received generally favourable views. 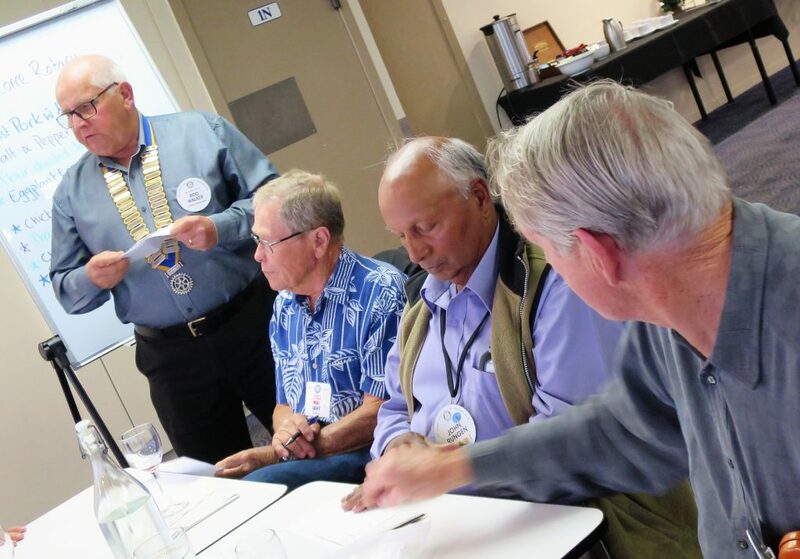 All Moruya Rotarians will be given the opportunity to vote for or against the trial. Their meeting this week will hold a short forum to discuss the issue and then all members will be emailed asking them to vote. If 75% of those replying are in favour of the change, it will be trialled for a six month period from January 2019. 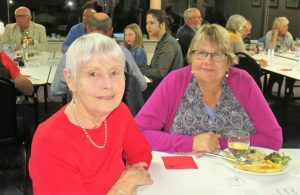 Nearly 100 people attended our 60th Anniversary and Changeover on Saturday night including special guests NSW Transport Minister and Member for Bega Andrew Constance, Eurobodalla Shire Mayor Cr Liz Innes and our District Governor Margaret Hassall. All feedback has been very positive. 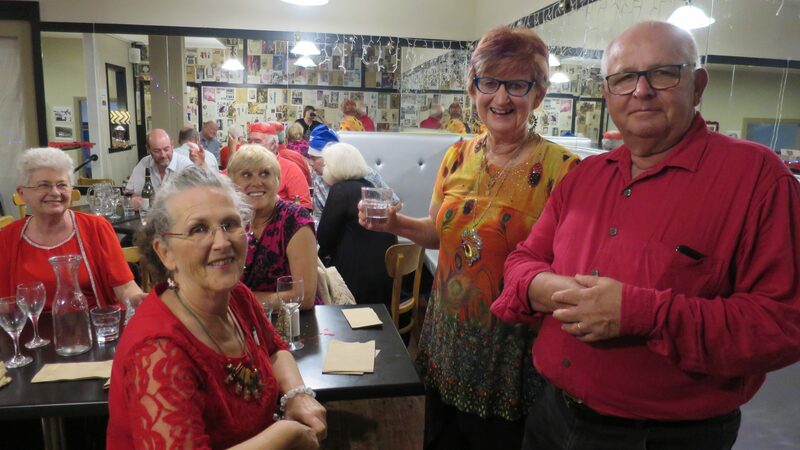 It was great to see so many different people from across our community joining us to celebrate 60 years of Narooma Rotary Club, including our fellow Rotarians from Moruya, Bega and Batemans Bay. Bob ‘Techman’ Aston has put the presentations by former presidents Jack Ings, Ian Tomlinson and Peter Bull up on YouTube. 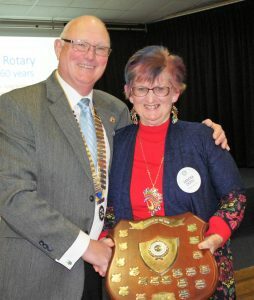 The link is https://youtu.be/-DPq1-VTRAY or just search for Narooma Rotary. Thanks to everyone who helped feed the Kidney Kar Rally on Sunday; 151 people enjoyed soup and a rissole or steak sandwich and some slice. We grossed $2,400. It ended up being a longer day than anticipated due to two accidents with the stragglers not arriving until 3.00pm. As usual Narooma Rotarians rose to the challenge. The Board has approved an initial $1,000 donation to the 2018 Drought Relief Fund to support drought-affected farming families. The Fund, launched last week, is a partnership between Rotary Australia, the National Farmers Federation and Channel 9. The Board also approved a $300 donation to Meals on Wheels. Tickets in the Whale Watching Raffle are selling fast at the two IGAs and at the Plaza. At this pace we will be sold out by the end of the month. If you are having trouble selling tickets, please let me know. Laurelle will chair the meeting because I will be away. If you have something you would like to discuss at Club Assembly, please try and let Laurelle know in advance. Our speaker will be Charmaine who will talk about her recent work in Timor Leste. 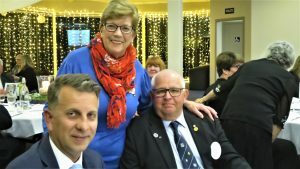 District 9710 Governor Margaret Hassall, NSW Minster for Transport and Member for Bega Andrew Constance and President Rod Walker. What a great night on Saturday! The auditorium looked terrific as we celebrated 60 years of Narooma Rotary in grand style and the vibe was really wonderful. The central mats, made by Sandra for each table from some of the many banners we have been given over the years, set off each table. Congratulations came from Mayor Liz and Andrew, while our District Governor Margaret Hassall read out a congratulatory message from Rotary International President Barry Rassin. Outgoing President Bob Aston awarded Sandra Doyle with Rotarian of the Year. 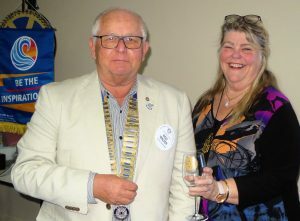 Highlights included messages of congratulations from three past Rotary Presidents unable to attend – Jack Ings, Ian Thomlinson and Peter Bull – followed by a PowerPoint review of Narooma Rotary’s 60 years’ of service (U tube link https://youtu.be/KLnkhbjKSuQ) . Both Mayor Liz and Andrew were particularly impressed by the Club’s past construction projects including the building of Narooma Sport & Leisure Centre. Andrew suggested we might like to consider a new Narooma Bridge as a future project, a suggestion quickly declined by President Rod. We also incorporated our official changeover into the evening’s proceedings with immediate Past President Bob awarding Sandra Doyle with the Rotarian of the Year Award, and naming Frank Eden and John Doyle as Paul Harris Fellows. Our Busking Festival winner Yasmine Russell came all the way from Wollongong to entertain us during the evening. 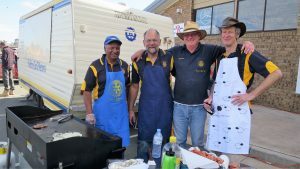 After the gala 60th celebration, many Rotarians fronted up next day to provide lunch for about 150 people from 45 cars as they passed through Narooma on the 30th annual Kidney Kar Rally. 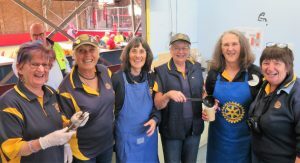 Several Rotarians had also found time to make soup (some very tasty combinations!) which we served to some very appreciative participants along with steak or rissole sandwiches with the works. Spokesperson Marie Paine said the nine-day 4,000 km rally from Goulburn to Queanbeyan via Ballarat raises funds to support Kidney Australia’s Kidney Kids Camps. These camps allow kids with kidney disease to enjoy camps and activities while still receiving the necessary medical care via the mobile dialysis bus. Cooking up a storm at the Kidney Kar Rally were John Rungen, left, John Doyle, Bob Aston and Frank Eden. The Rally route travels through many towns and villages as well as uses a number of tracks through National Parks and State Forests. Each car has to raise its own sponsorship. Narooma local Heather Snell was among the participants. Further to what President Rod has said about our initial donation to the recently launched Drought Relief Fund, a partnership between Rotary Australia, the National Farmers Federation (NFF) and Channel 9… As a registered charitable organisation, Rotary Australia will collect and administer donations which will be tax deductible. The NFF, the farmers’ peak body, will direct funding to the relief organisations best placed to make an impact for farmers on the ground. It has undertaken to ensure 100% of funds collected are applied to the large gambit of needs currently being experienced by farmers, including fodder and water shortages, help with everyday living expenses and access to health and financial support services. John Rungen, left and President Rod Walker sell some tickets to Narooma local Joan Lynch. It’s a not for profit organisation established in 2014 by a group of parents of disabled children who were travelling great distances to find support services. It is a Registered Provider with NDIS of disability services for children in Eurobodalla. It’s run by CEO Cate McMath and a staff of part time helpers with the support of a group of volunteers. The clientele are divided into groups aged 0 to 6 and 7 to teenage. The average number of children under treatment is around 80 to 90 per month. The present premises in the Industrial Estate are inadequate and a new a new therapy centre is being constructed, opening 19 October. The trivia quiz returns due to popular demand. Sandra Doyle was our winner last time. First in with the correct answer will assume her title as Rotary Quiz Master. Name the largest freshwater lake in the world? What item of clothing was named after its Scottish inventor? 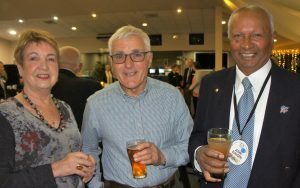 Denise Rungen, Narooma Rotarians Michael O’Connor and John Rungen at Narooma Rotary’s 60th celebrations on Saturday night. 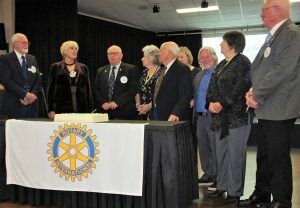 Having cut the cake, past presidents of Narooma Rotary joined in the singing of ‘Happy Birthday’ to the Club. 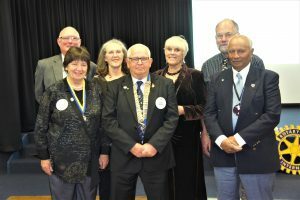 Shown are Brice Grimmond, left, Ang Ulrichsen, current President Rod Walker, Marilyn Gibson, Norm Hoyer, Georgina Staley, Bob Antill, Laurelle Pacey and Bob Aston. 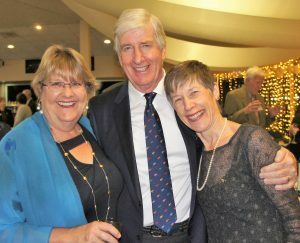 Narooma Rotarian Charmaine White and Jock and Jenny Munro at Narooma Rotary’s 60th celebrations on Saturday night. Last Thursday we had a great night at the Mama Mia premiere. Eighty-two people attended and by all accounts everyone had a good time. The movie was well received. Thanks to Angie and the catering team for their effort and to all those who donated to the raffle, and to Rachel and her mother-in-law for selling the tickets. We made over $700 dollars for the Polio campaign, a good result. 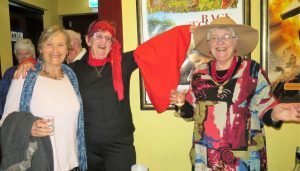 Lynda Ord, Lynda’s friend and Ang Ulrichsen at Mama Mia recently. We could do with another Director to take on co-ordination of our Youth programs and the Duck Race. We still need a President Elect for 2019-20 to prepare for the next year and co-ordinate International, Foundation and ARH activities. Both these roles can take as much or as little time as you like. No one will be judging your performance; we just need someone to step up. If you are interested let me know. Julie is a Diabetes Educator and Registered Nurse. Her topic: ‘It’s complicated…. Is it possible to live well with Diabetes?’ Julie has been nursing since 1980 and trained at both Mater Misericordia and Royal North Shore Hospitals in Sydney. Since 2008 she has been working on Diabetes, and currently works full time for Eurobodalla Community Health covering Narooma, Moruya and Batemans Bay areas. Please don’t forget to let Bob know if you are bringing guests. Our very own Rotarian dentist Charmaine White in Timor Leste recently. Week 1: We worked in three places – the local Maliana hospital, a local school and a village Cailaku that had never seen a dentist. We got to see community and school students. Examinations 838, extractions 268 and fillings 206 plus some scaling as well. Our main aim was to relieve pain. Some of the teeth would have been sore for months if not years. Betel nut chewing is still a big problem in the Maliana district. 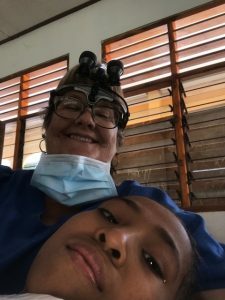 Week 2: A dentist team swap at Dili – one flew out and one joined us. Then we spent three days in Bogoro School with 900 students. The last two days were at Maubara clinic which is a room In the Carmelites convent. The local dental nurse Nico had screened all the children so we just had to do the work mainly extractions (258) and fillings (197). Overall we saw 1,261 children in the two weeks. We extracted 527 teeth; only three refused treatment i.e. ran away or cried. There are so many brave children in Timor Leste We filled 406 teeth, did a few scales (49) and prevention on teeth fissure seals. To which I replied, ‘If it was without my knowledge, how would know?’ He smiled knowingly and nodded, ‘That’s why we ask’.